Cutting to the chase, Word does not auto-save. 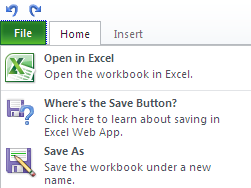 Typically I think most people (my wife included, of course) would save as they go, but there’s a big inconsistency in the user experience of the Office Web Apps: there is no Save button in Excel, OneNote or PowerPoint. In fact, there’s a Where’s the Save Button? dialogue where you’d expect to find it. On the other hand, Word not only has the Save button, but it doesn’t auto-save, as the full version of Word does. Note the Save icon also appears beside the Undo and Redo buttons above the Backstage. In Microsoft’s defence, if you close the browser or navigate away from a Word document, the browser prompts to save changes, but this is a generic form field message. It turns out this was noted by the Register back at launch. There are many inconsistencies. The buttons for opening a document in desktop Office depend on an ActiveX control or a Firefox plug-in that does not work in Firefox with Office 2007 or 2003 and only works on Windows. Another annoyance is Microsoft disables the ability to create documents in the browser if desktop Office is available, though you can get round this by using Chrome. A further inconsistency is that PowerPoint, Excel, and OneNote save on the fly, but Word makes you click Save. Given that the Auto-save functionality in PowerPoint and Excel are sophisticated enough to capture unsaved data even if navigating away from the document or closing the browser, it’s not clear to me why some kind of auto-save or warning couldn’t be built in to Word rather than relying on the browser to display a generic message. Ultimately I suppose this can be handled as a training issue, but a consistent user experience would be preferable, especially if this is targeted at home users. I can’t believe this is still not fixed. I found this page because I had just the same thing happen, wrote a document, closed the browser (which did not give a prompt) and was presented with a blank doc when I tried to reopen. Having previously used the excel web app which does autosave I was baffled at this inconsistency. What an oversight on Microsofts part. They cannot compete with google docs with no autosave.